In this tutorial we will make Particles for your lyric video or any other motion graphics project without the usage of any external plugins. 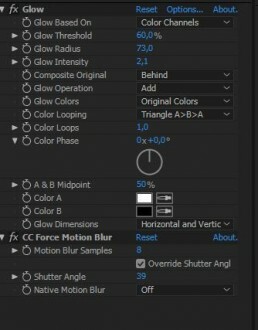 All may be done within Adobe After Effects. With this technique you’ll be able to create dusts, sparks or any other particle-based elements. Also, we’ll take a look at “shape layers” theme and basic expressions. Low cost. You don’t have to buy any other plugins. No need in spending too much time on learning new software. Available even for beginners. 3. Then we have to make Shape Layer. This layer will be our Particles layer with dusts or sparks. 4. Here we’ll choose particle Shape. It may be a square, or a round, or a triangle, or any other custom form. In this tutorial we’ll work with Round. Now, let’s digress a bit and do some housekeeping. Press Add one more time and create Group. Drag all the elements inside. Rename the group and shape layer. Now we have to animate this particle element. Let’s make it start outside the screen. a) Choose a layer with particle and drag it outside after effects Region of interest (just not too far). e) You might be asking yourself (and us) – “should I make this for every second?!!!!1”. Sure, not. It might be simpler with Expressions. LoopOut function allows to loop animation. There are much more parameters of course, but let’s keep an eye on Cycle and PingPong. Hold Alt and press Clock symbol. Then paste our expression code there. You’ll get looped animation as a result. Let’s take a look at this preview. Pretty nice, but we need some work for this. Let’s add some chaos and random movement here. For this, we’ll use one more basic expression – wiggle. Wiggle (1,8) – if we take it closer, we’ll see that digit 1 means quantity of changes per second and digit 8 means meaning of this change. For example, with these meanings our particle will change position for every 8 pixels per 1 second. I suggest to make wiggle (10,800). Apply this to particle and play the preview. Now we have chaotic movement, but where is a loop? Let’s make our expression a little bit more complicated. This code will add looped motion. Let’s add these plugins to our layer with particle. Just duplicate this particle and get desired quantity. Motions will be different due to expression code for wiggle. One more tip – just move our copies a little bit and make different keys for every layer. Such move will make our particles completely different. Now, you can use such particles for your lyric video production or any other motion graphics video.